Not unlike the more comprehensively detailed and immaculately Judaic Book of Matthew, Luke reinforces the celebrated process of the birth of Jesus with the genealogy of Jesus. While Matthew and Luke's genealogies appear to differ, the brilliant record-keeping indicates that the ostensible discrepancies in the twin genealogies of Jesus Christ are not discrepancies at all, but merely disparately traversing bloodlines. Matthew's genealogical study follows from Joseph through David's son Solomon while Luke's chooses Mary (in this context quite wisely, especially as believers do not consider Joseph the “true father” of Jesus in the strict biological sense), following through David's son Nathan. The Nativity is visually rustic, dustily caked over with a light layer of dirt and grime. Yet later Martin Scorsese's suppositiously scandalous The Last Temptation of Christ—featuring Scorsese's tested Catholicism contesting screenwriter Paul Schrader's strident Calvinism—and Mel Gibson's swelteringly venerational The Passion of the Christ each placed their respective Christ sagas within an increasingly augmented sense of spatial and geographical realism and grittiness. The oppressive heat, preeminent squalor (markedly palpable in the latter film especially, with the coolly foggy and damply drenched Garden of Gethsemane with which the picture opened contrasting against the bitterly chalky environs that populate the majority of the film's running time. The Renaissance's greater artistic extrapolations focusing more squarely on the humanity of the divine in the figure of Christ finds intriguing antithetical prisms in the art of musical celebrations of Christ. Martin Luther's favorite composer, Josquin Desprez, born in Belgium in 1440, created lyrically polyphonous mellifluousness. His Missa de Beata Virgine is enriched by the use of multi-voiced chanting; his Ave based on the Gregorian chant, hauntingly numinous in its dexterous construction. That such evanescent beauty could emanate from such a ontically beleaguered reality and sociopolitically oppressed existence, under the nominal authority and control of the Romans. It is in the supporting performances where the film becomes most expressively painterly and physiologically phrenic. Paul Stewart plays Zacharias, the dumb-stricken husband, punished by God for his disbelief of his wife's pregnancy. The epiphanous scene in which he is confronted by the truth carried with intrepid confidence by Audrey Totter (intrinsically rugged dame of film noir pictures such as The Set-Up and Tension) as Elizabeth is simply moving. Totter's performance as the sagely tempered and measured Elizabeth enlivens the film. Acting as a vicarious mother figure for the socially bedraggled Mary, Elizabeth's quiescently honeyed voice puts Mary and the viewer completely at ease. What aids the film its the eliding of some of the stuffier formalities often attendant to features that delved into Biblical stories and personages. The great difference between The Nativity—which, unlike the infectious musical cornucopia of Jesus Christ Superstar, antipodally bases itself as an austerely reverential tale of love, faith and family—and the self-important Biblical epics created by Hollywood is the departure from imposing grandeur at the expense of sincere personalization. 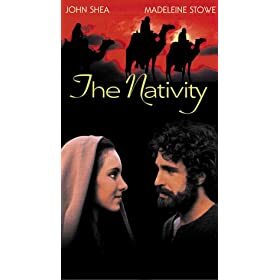 In The Nativity, made for television, Stowe's Mary and Shea's Joseph are fully rounded human beings whose choices and fates become as intertwined as a “normal” couple, without reducing the coupling to any sort of off-putting mundaneness. It is in this way that The Nativity has its proverbial cake while eating it, too, but it is not unreasonable to dramatically project the images of the parents of Yeshua of Nazareth as divinely inspired human beings. Entirely ill-defined and almost incomprehensibly shallow Hollywood efforts of erecting some circuitously Judeo-Christian safeguards commonly played the part of creating dissonance out of likely structural harmony in numerous forays into stories from the Bible. (One most bizarrely ahistorical and ironically anti-Biblical reinterpretation of Salome , casting the beautiful schemer and co-conspirator asking for John the Baptist's head played by Rita Hayworth as wholly misunderstood and finally a heroic figure.) What The Nativity presents most in its finely etched fabric is a subtly ethereal empathy, endowing the ensemble of sufficiently distinctive qualities that determinedly exalt the occasionally unspectacular competence of the production as something far weightier than its filmic disposition may initially suggest. Stowe is charged with shouldering the most persistently distilled purity of emotion, coupling youthful naivete and fervent belief, which somehow provides a trundling central fixture to this most profoundly simple substratal of one brave young woman's journey—of body and spirit. The radiantly beaming satisfaction and joy Stowe's Mary visibly feels as she holds her son in the film's closing passage is worthily focused upon by Kowalski, instilling the film with just the necessary helping of wonder at a mother's loving act of creating the life fraught with the accompaniment of joyous sacrifice. Stowe's Madonna possesses a resoluteness that transposes tribal Hebraic gender roles—as the Gospels relate, it is she who literally leads Joseph, doubting as he is until finally finding the truth himself. Since 1950's papal encyclical by Pope Pius XII, Munificentissimus Deus, declaring the corporeal assumption of Mary, the doctrine of Mary as completely human before all else is artistically bolstered by The Nativity's overarching credibility as thoughtful drama. I applaud you Alexander for decorating Coleman's Corner with holiday cinema, all made possible by your thorough and encyclopedic knowledge and appreciation of movie history. I must say I agree with your reasonably favorable position on THE NATIVITY (finally reached in your 'overarching' final sentences) and fully appreciate your Bilblical footnoting and historical context in the opening sections. Yes, i agree the film has a visually 'rustic' quality, and the film's supporting characters bring this reverential treatment to full fruition. Inevitably, you needed to bring up both THE LAST TEMPTATION OF CHRIST (a film I do love) and THE PASSION OF THE CHRIST (a film i do not) in this discourse, and for me THE NATIVITY falls between them in the level of affection I can can muster up here. Your construction for this particular piece is fabulous. Thank you kindly, Christmas Mastermind, and of course, Sam. I am glad you enjoyed this timely review. Wonderfully illustrated piece, with Biblical quotations and cross-examples from music, Biblical scholarship, and cinema history. Your appreciation of humanism in religious filmmaking is, in turn, much appreciated. Hollywood's traditional neutering and spectacularization of the Bible has been superseded, unfortunately, by a complete evasion of one of Western civilization's cenral texts and belief systems. At any rate, your compelling viewpoint has caused me to add The Nativity to my Netflix queue. Thank you very much for the extremely kind words, Movie Man. I completely agree that Hollywood's past of "spectacularization" of the Bible has been "superseded" by a complete evasion of one of Western civilization's most important texts. Thank you again, and I'm happy to see the review has influenced you to give this movie a try. Alexander, between this and your SYNECDOCHE, NEW YORK review from a month back or so I just have to say your scholarship in the field of religion and Catholicism is very interesting. Any other reviews you've written with religious undertones? I myself like religious allegories a lot. You know, Movie Man, I almost remarked that I doubted it would be available on Netflix. It's an unfortuantely fairly obscure (television) movie nowadays. As a testament to its obscurity and age, I only have it on an old, creaky BETA tape. I just saw a commenter over at IMDB say that he hopes this receives a DVD release one day. Moses, thanks for the kind words. Thank you for pointing this movie out to all of us. Excellent review. I love the way you organized it with Biblical quotes and brought up great comparisons in music that are totally beyond me. Thank you for the very kind remarks, Tim. Much appreciated. Thank you, Craig! Happy Holidays, my friend! Thank you, KB! Merry Christmas. This can't work as a matter of fact, that is exactly what I believe.